One of my favorite plants I like to grow in my garden are roses, especially if they exude a strong sweet and irresistible deep scent. These types of roses are perfect candidates for use in the pastry lab. 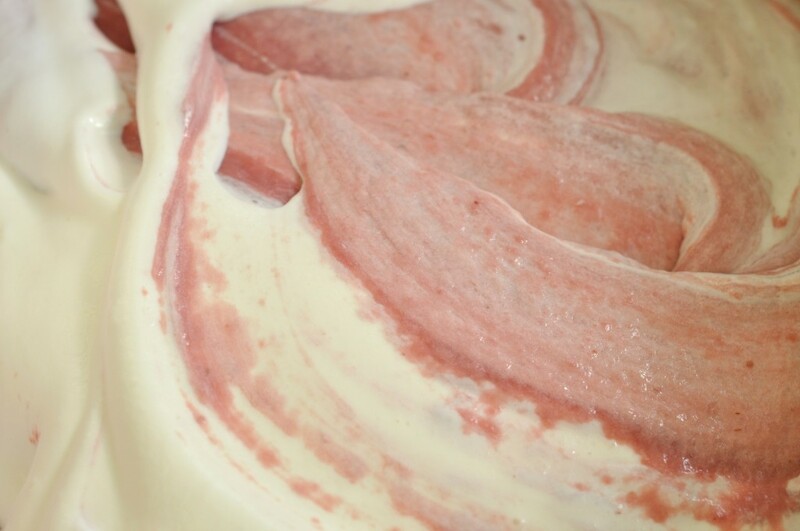 Whether they will be used for rose petal jam, rose sorbet, rose cake, a strong scented rose is always best suited. In my experience, I have found that the darker colored roses with thick velvety petals carry the true flavor and scent of rose. Oftentimes yellow and other colored roses may hint of lemon, violet or other fruits and do not work as well in the preparation of desserts. Using rose in pastry can be wonderful but in certain preparations its scent can be indulgent. Therefore, oftentimes I like to combine rose with selected fruit to hone the flavor. In fact, rose loves the company of fruit and for most dessert applications I prefer to combine the essence of rose with fruits belonging to the rose family. 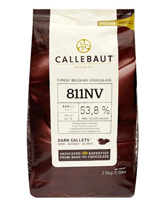 Perfect combinations include raspberry, strawberry, cherry and a few others, all belonging to the rose family. The combination of rose and fruit balances the perfume flavor which some find undesirable. 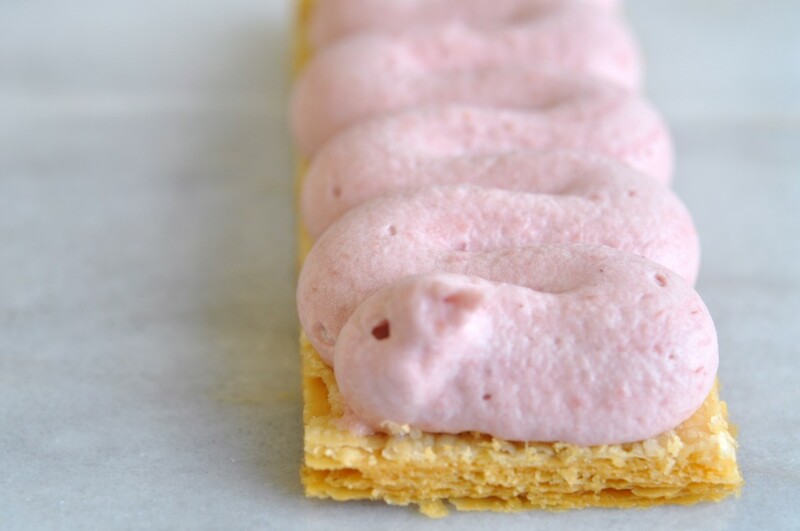 The rose flavored Crème légère should be made the day it is used and the puff pastry should be baked the same day. Roll enough puff pastry (On Baking pg 282) to make about a half size sheet pan and 1/12 inch (2 mm) thick, bake at 400°F (200°C). 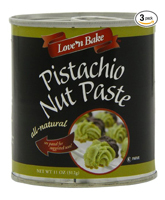 Once the dough has quadrupled and the surface has gelatinized place a perforated sheet on the dough to ensure an even surface. Reduce the oven temperature to 350°F (180°C) or slightly cooler and bake until fully crisp. When cold cut the dough into desired size pieces and sprinkle evenly with extra fine granulated sugar. Caramelize the surface evenly with a torch. Let cool. Rose flavored Crème légère and pipe a layer on caramelized puff pastry. Cover with another layer of puff pastry and pipe another layer of the cream. 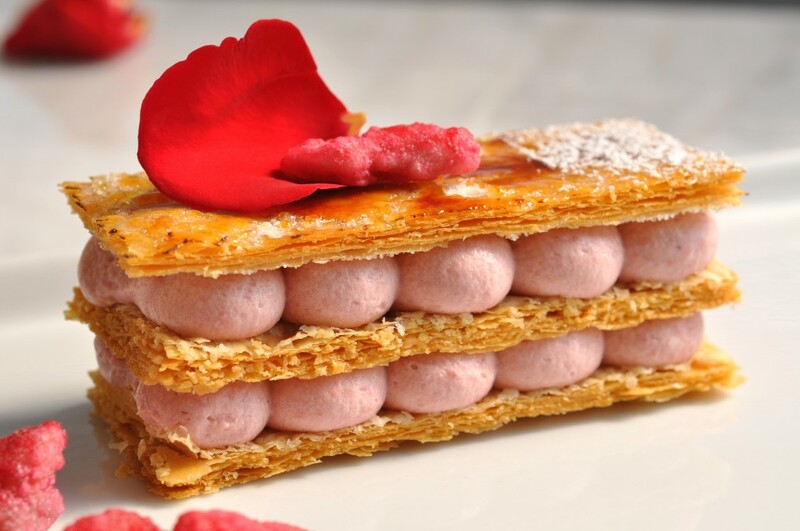 Finalize with another puff pastry layer and decorate with organic rose petals and crystallized rose petal. Note a Crème légère is a pastry cream “lightened” by whipped cream. In a saucepan bring the heavy cream (a), raspberry puree and sugar (a) to a boil. 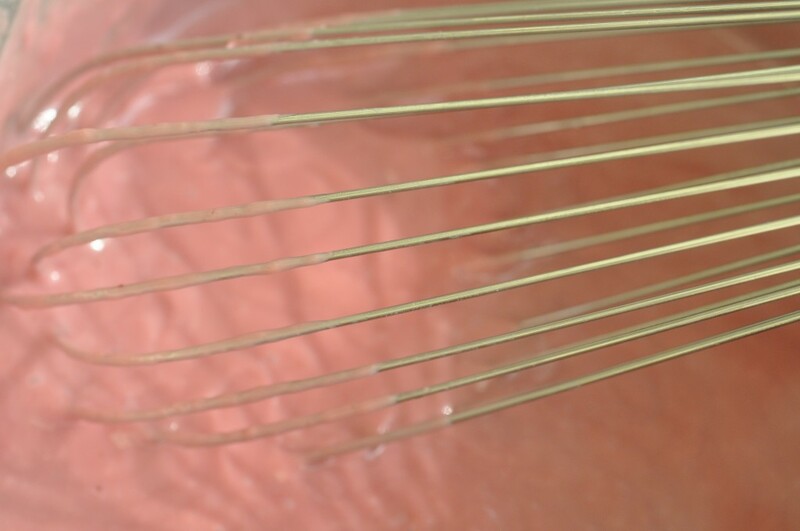 In a separate bowl whisk the egg yolks until smooth. Add sugar (b) and whisk rapidly until smooth, add cornstarch and whisk smooth. Whisk in the boiling milk. Pour the egg yolk mixture into the boiling cream mixture and whisk rapidly to a boil. Boil for 1 minute and remove from heat. 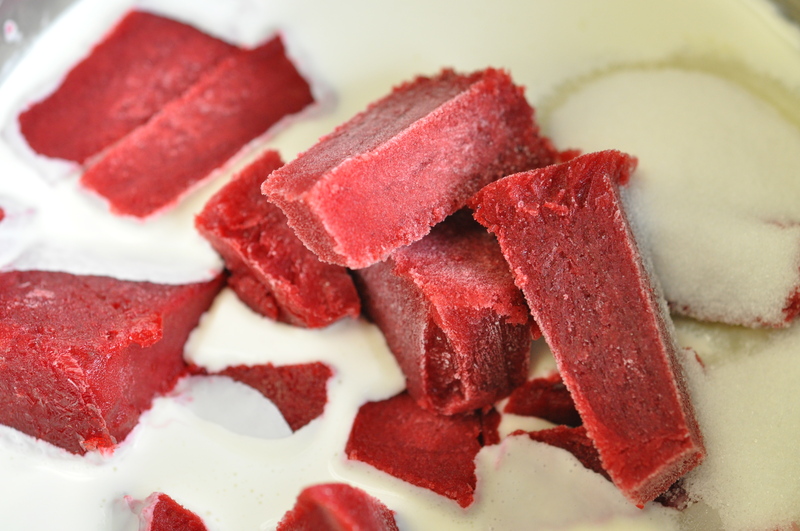 Cover the crème with plastic food film and place in an ice bath to quickly cool the cream until cold. Whip the whipping cream (b) until moussed (Soft peak). 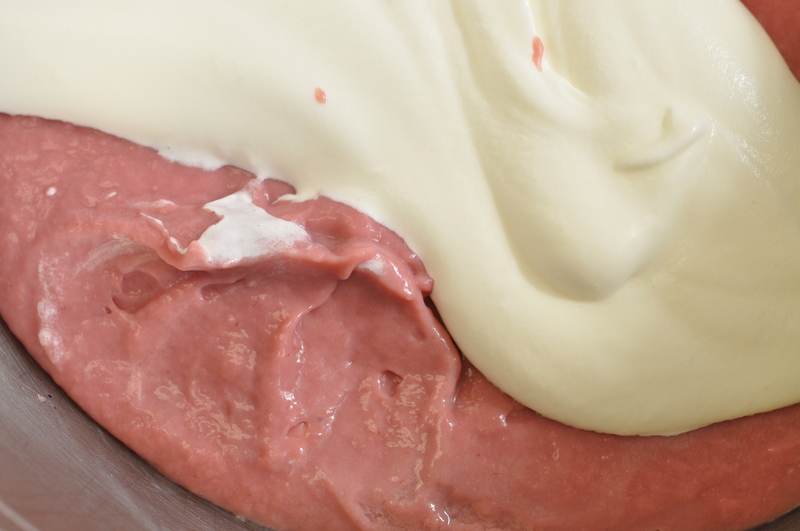 Add the rose essence to the pastry cream and whisk smooth. Fold in the moussed cream and gently fold together. Yummy! This is beautiful! It looks amazing, and I can’t wait to try! Always something new and exciting from you! Oh, wow, Chef! Boy how I wish I could be there to try that! I was re-reading… sorry I didn’t think to add this to my earlier post. Rose essence: how is it made? Or where can I find it? Can I even make my own? I can not wait to make this myself, thanks for sharing. Cheers! 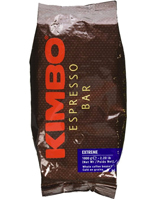 Making your own essence is difficult but food suppliers do sell extracts-compounds. Another way to go is to use a good quality rose water available in better stocked grocery stores. 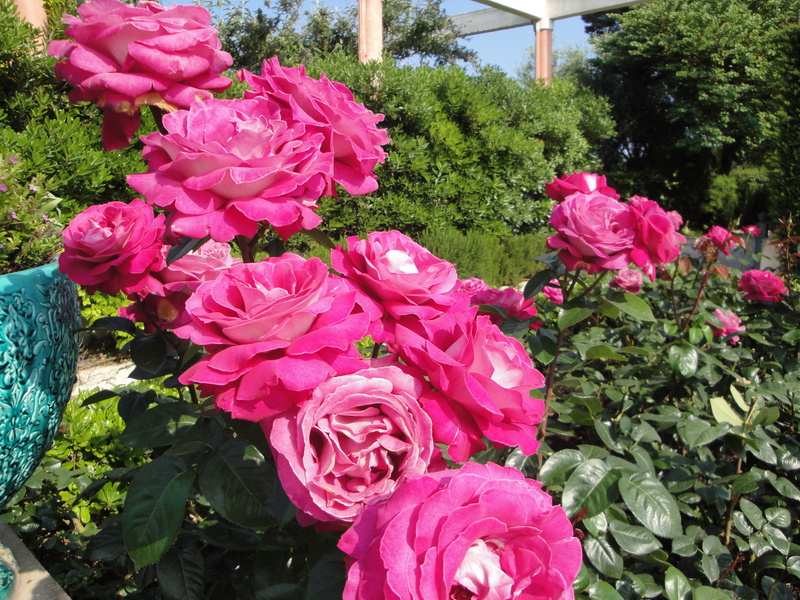 Essential oil of rose is available in health food stores and is another option. The latter is very strong and is best diluted first in some vodka. Wow! I made a rose petal sorbet a couple of weeks ago and I was amazed! I’ve got to try this creme legere, I still have roses in my garden. This looks amazing and delicious. Thank you for the recipe Chef! Hi Eddie, beautiful post as always. Can you give us a tip of how to cut puff pastry without destroying it? Every time I make a napoleon is very, very difficult to cut it. This looks like a work of art, so delicate and just beautiful. I can just imagine biting into that wonderful flaky pastry. Gorgeous. The best way to cut Napoleons is to cut the puff pastry sheet in equal pieces before you fill them. Then pipe the cream and build together. Personally I do not like fondant that much on Napoleons so this method works perfectly. If you do use fondant, then you have to make it indeed into a “strip” and then cut using a sawing motion with a super sharp knife. How beautiful-I’m going to borrow this recipe for the roses in my garden this week. Lovely blog..
What do you mean by a perforated sheet? something like a silpat mat? A perforated baking sheet is a sheet which has holes in it. Basically it allows steams to escape during baking while keeping the dough flat. What nice pastry with the rose. 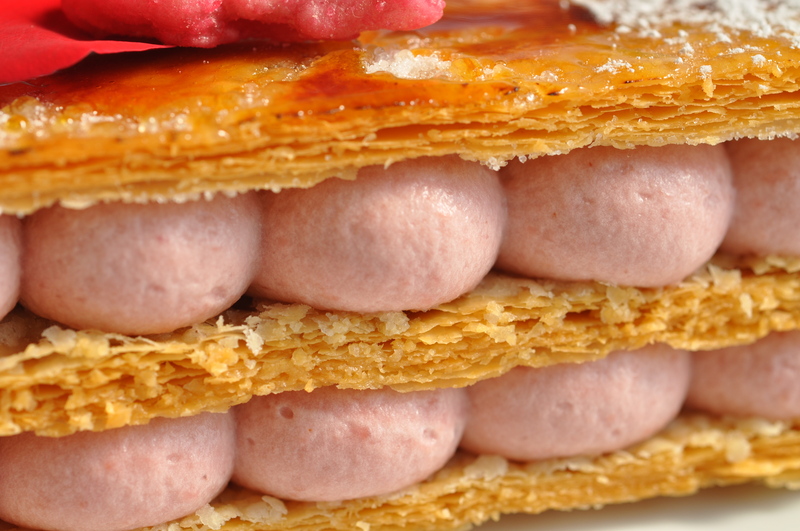 Would you pls also share the recipe of this puff pastry? I can’t find it in the blog. I’m just looking for Napoleons recipe look exactly the same as your pictures. Many thanks for this wonderful blog. The recipe for puff pastry is not scheduled to be featured for some time, however it certainly will. 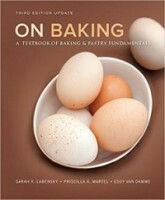 In the mean you could find it in the third edition of “On Baking” on page 280. Perhaps a friend of yours has the book. This was such a beautiful dessert to make, though I think my filling was either too soft or I was a bit too heavy handed in piping it in because my puff pastry kept skidding. I guess I just need to practice more.